Dimensions: 8-3/4 x 8 in. 132 pages. 40 images, 10 pattern pages for 35 projects in an attached envelope. Paperback. 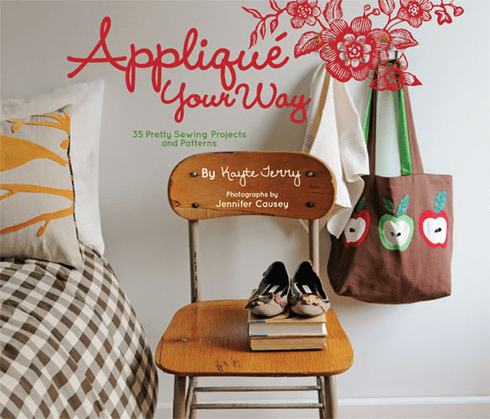 Applique Your Way goes beyond traditional quilt work with 35 sweet stitching projects from crafter extraordinaire Kayte Terry. Master decorative stitches, create original templates, and much more. The book is designed for easy use with a lay-flat Wire-O binding and a handy back pocket that holds pattern and template pieces. No more wrestling with a copy machine to enlarge or shrink! Stitchers will find everything they need to create a Gone Dotty A-line Skirt, a Reverse Applique Market Tote, a Felted Faux Bois Scarf, and 30+ more projects ranging from the sublimely simple to the ultra-chic.